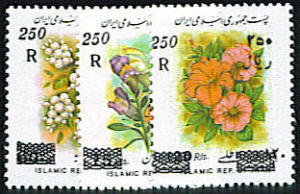 A total of 33 stamps. All the issues of Scott #2758 and #2761-2772, #2787-2790. For #2759-60 and 2776-2786A, see the Definitive issues. Scott #2751, 200 Rial surcharge, overprint on 3 Rial Mosque issue, Scott #2296A.